But what has been left out of the picture is Markelov's engagement in left-wing and labour activism. Here, we present an abridged translation of an October 2006 interview conducted by sociologist Alexander Bikbov, which addresses Markelov's role as an activist and lawyer in workplace disputes. It starts with reflections from Alexander Bikbov, written in memory of Markelov ten years on from January 2009. 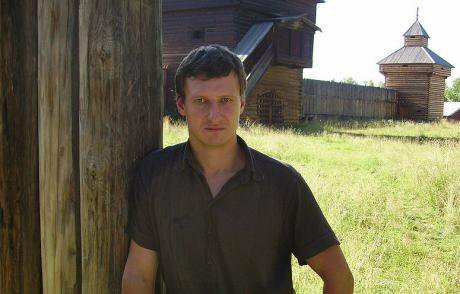 From Alexander Bikbov: Shot dead by a neo-Nazi killer on 19 January 2009, Stanislav Markelov was a real phenomenon, a living embodiment of an impossible collection of qualities. Incredibly successful, a lawyer in some of the most high-profile cases at the age of 34, a leader of the young left, a person who belonged to many separate milieu, a supporter of a strong social state who loved punk rock, the legal representative of anti-fascists, trade unions, neformaly and independent newspaper Novaya Gazeta, a fiery rights defender and just as fiery critic of Russian liberalism, a political firebrand and public intellectual who had every chance to become a truly important figure in the new, still emerging epoch. As so often happens, the most well-known part of Markelov’s biography starts with his professional successes: the political trials that he regularly won, or which, even when he lost, managed to transform into a public demonstration of the Russian justice system’s inertia. Examining earlier moments in his biography and the less well-known sides of his professional life allow us to clarify the source of his surprising skills and far from ordinary views. The interview published below is particularly valuable in this regard. Responding to my request to discuss Russian trade unions and his legal practice, in effect, Markelov dived into that dimension of his life and work, where the historical is closely interwoven with the intimately biographical. Here, we see Markelov – an organiser in the largest student movement of the 1990s, Markelov – the legal representative for workers who had lost their jobs at factories in the regions, Markelov – a practitioner of radical social democracy. All of these far from obvious careers of a successful lawyer illustrate perfectly the unusual trajectory he followed. Today, just like when we were speaking 12 years ago, I am struck by the rational rigour and the saturation of images with which Stanislav describes the three areas of experience that he was steeped in. 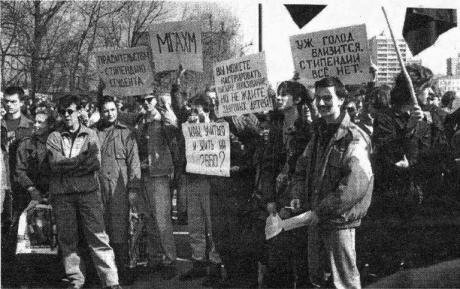 These are the student protests of the 1990s, the conflicts of workers with factory administrations in the 2000s, and the tactics of labour conflicts hidden behind the facade of Russia’s constantly changing legislation. He looks at these spheres with the irreproachable gaze of a strategist, one who is interested in how things happen, what prevents a movement from reaching its goal, and how to change the situation on the fundamental level. That said, it’s impossible not to notice those cunning flashes of a player and wit coursing through Markelov’s strategic analysis. Thus, telling the story of the rise and fall of the student trade union movement (Student Defence) in the 1990s, of which he was a co-organiser, Stanislav doesn’t fail to mention the key role of “hanging out” and ideological “lack of principles” in organising work. Describing the development of labour conflicts, Markelov is sincerely impressed not by workers’ resolve, but their myopia. As any worthy foe, he also occasionally remarks on the cunning and manipulations of the factory administration. Markelov’s responses reflect a stunning grasp of details and ability to knot them together. His breakdown of the Vyborg Paper Factory case at the end of the 1990s, where workers seized their enterprise in order to relaunch production, feels like a ready-made film scenario in the spirit of Martin Scorsese’s Gangs of New York. The description of the 1995 student demonstration in the centre of Moscow sounds like a plan tucked away for the future. Ten years on, Markelov still manages to reproduce the demonstration’s exact route through the city, where it stops and the substance of key events. Ten years after this interview, a lot has changed in professional legal representation. A whole generation of lawyers has formed thanks to political and labour cases — people Stanislav could have called his colleagues in the true meaning of the word. “Cranes” with their envelopes stuffed with case go from office to office less often. But shifts in the organisation of a number of work forces, which Markelov notes back in 2006, have become an important part of the wider picture. On the one hand, small unions in the education and cultural sectors have come to the fore. On the other, the fight against independent unions has intensified, and the position of corporate unions, where management is united with workers, has been strengthened. Wonderfully precise and filled with specifics, Markelov’s observations become, in current conditions, an important resource for evaluation and comparison. It feel as if Markelov, treasonously stopped at the cusp of the new decade, has taken a side-street past this unfriendly decade and wound up in a new, so far unknown epoch. This interview was originally published in an abridged version in the No one else but me collection, devoted to the memory of Stanislav Markelov. For this publication, I checked the transcript against the audio, removing inaccuracies and restoring previously unpublished fragments. AB: Can you say a few words about how the independent workers movement emerged in Russia? SM: Prior to the 1990s, the independent workers movement was a big problem for the Soviet authorities. And it was a lot more powerful than the dissident movement. The dissident human rights movement was concentrated mainly in the big cities, it had connections in the west via international journalists. America and Europe would find out instantly about their three-people strong demonstrations. But they didn’t know anything about the workers movement. Workers held demonstrations constantly in the Soviet Union, and occasionally attracted up to several thousand people. That said, they were very disparate, there was no organisation, and in the majority of cases remained unreported. 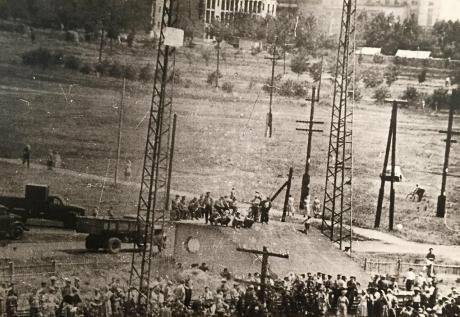 The first day of protests in Novocherkassk: workers block the railway and hang from an electrical tower a banner reading, “Meat, butter, and higher pay!” 1 June, 1962. Image displayed at the Novocherkassk Memorial Museum. Via Meduza. At the end of the 1980s, with the democratic wave on the rise, the workers movement was welcomed by the liberal elite very warmly. It was then, in effect, that the [process of] creating independent unions started. Liberals reported every worker demonstration because they were directed against Soviet power and, accordingly, were useful for them. When I spoke to them afterwards, many worker leaders of the 1980s would say: “Yes, we remember that very well, and we understand that we were used.” This realisation, to different degrees of clarity, came at the end of 1991. That is, during the first year of the new rise of the worker movement in Kuzbass, in Belarus, which previously had been completely loyal to Soviet power. They carried out strikes which paralysed transport routes. Naturally, the demands of workers were justified. You had [a system of] privileges, an elite which took everything, and then a trade union, which did nothing and basically formed part of enterprise management. It’s worth noting that after 1991 nothing changed: that same elite received the same advantages that it had before 1991 — and these were the same people, only now they had the status of businessmen, rather than [enterprise] directors. Meanwhile, official trade unions began to perform the function of organising workers for forced labour, more or less as slaves of these businessmen. Regarding the transformation of the old party leadership into businessmen, there’s one interesting fact I can bring up. At one time I was able to browse the catalogue of the KPSS internal party library, which records whether were books were in demand. As it turned out, the most popular books among readers were books on management and business published in the west — these were often requested. Practically no one ordered books on the worker movement, scientific communism and so on. At the end of the 1980s, the trade union movement made a rapid shift onto completely different tracks. A section of the trade unions were bought up — and this was done so openly that it recalled the situation in the US during the 1920s. AB: And who bought them? SM: Local authorities and business, mostly. In Russia, it was clearly visible how they had merged. In effect, they were one and the same. Or more accurately, business was in charge of the state. This was the fate of KSPR [Confederation of Free Trade Unions of Russia], and that’s only the most prominent example. The forms of worker protest changed too. There was also a wave of hunger rebellions, covered up by the authorities, who at that time were liberals, in the 1990s. But I know it for sure. The rebellions arose when enterprises stopped working. Not from strikes, but factories coming to a stop. And it didn’t come in a wave, but a tsunami. In response, workers had to resort to forms of resistance which would be considered the most radical in the west — blocking transport routes. The media reacted to this, but they didn’t cause the same impact as in, say, England or Germany. An example of one of the most prominent anti-privatisation initiatives is the Vyborg Paper Factory [1996-1999]. This is the most famous case, and I was involved in it. The Vyborg Paper Factory was a unique company, there’s only two of its kind in Europe. And Vyborg is right next to Petersburg, it’s not some backwater. People started literally going hungry there. There was no money, and people took loans and then paid them back in potatoes. They brought children into the town canteen just to look at food. They had to live off the land. In the summer, they collected mushrooms, berries. Vzglyad report on the Vyborg Paper Factory dispute, October 1999. Source: YouTube. The factory was privatised – as ever with many violations. The factory workers were waiting for a new owner, so they can start work. But the owner didn’t appear. And the employees started searching for him. Meanwhile, the owner had already sold everything and sold the maximum number of shares. It turns out that this person, who sold the factory for 16,000 roubles, who received fantastic dividends, is wanted on an Interpol search warrant. And the workers, together with Interpol, are searching for him. So then he employees seized the factory, issued a single share, which is transferred to the factory’s trade union (created by them), and then started work. Immediately, the factory starts making a profit and paying taxes to the state. Prior, the factory hadn’t brought in anything for a few year. How did this Vyborg story end? It ended with a riot police (OMON) raid [14 October 1999]. And not your ordinary riot police, but Typhoon, the special forces unit that puts down prison riots. The OMON unit raided the factory, leaving several dozen people, including women, brutally beaten. After the raid, workers rose up and managed to block the OMON from further action. Then came a wave [of reaction] in the liberal press. Which occasionally featured demands to bring the workers (who restored the factory, which began bringing the state money) to account, rather than the owners and authorities. Among the media that did this was Izvestia. 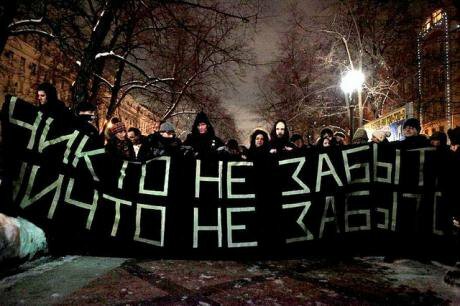 One of the articles against the workers ended with the words: “Why didn’t the Kantemirov Division mobilise?” That is, why didn’t they beat the workers up even more and bring in the tanks? A telling example of liberal journalism and a liberal newspaper of the time. AB: Why did the liberal press react this way? Was this fear of the communist regime being restored or something else? SM: I think fears over restoration of the communist regime was a cover. They told that story to everyone they could. The Russian Communist Party were the last ones who wanted to come to power, its leadership was living pretty well at that point. In fact, it was a fear of reexamining the results of privatisation. AB: And liberal journalists had an interest in this? SM: And who pays them exactly? [Laughs] By the way, the Vyborg case demonstrated the key weakness of the trade union movement. It retained its faith in the authorities until the very last moment. The evil bandits were there, in the regions, but at the top everyone was good. It’s enough to show how corrupt the local authorities are, and Moscow will sort everything out, Moscow will understand. “If we’re right, then we don’t need to demonstrate it” and so on. This is how they lost all the court proceedings, they didn’t even have any lawyers. When they started contacting lawyers, the lawyers couldn’t work with them — the workers weren’t used to talking to people who weren’t workers, i.e. clients of the state. The employees lost all the courts. In the end, a criminal case was opened against the workers, although all the injuries — and they were serious, broken limbs, concussion and beaten kidneys —were on the side of the employees. A riot case was opened, and that’s a serious charge, up to 15 years in prison. Moreover, the defendants were charged with preventing court officials and law enforcement officers from carrying out their work. In the end they were completely defeated. And the Vyborg Paper Factory was sold off. The next strong indicator of worker activity were the strikes organised by the air traffic control unions. Look at which unions are most effective since the end of the 1990s. It’s the air traffic controllers, dockers, who recently organised a very big strike in Petersburg, and sailors. These are those categories of workers who are in the most demand and have material assets. They have pretty big wages, true, they’re not comparable to how difficult their work is, or their conditions. And their actions always lead to the desired result, in contrast to demonstrations by everyone else. AB: What about the miners at the end of the 1990s? SM: The situation with miners was different: when the mines’ main assets were being sold off, no one needed them. And the companies need the miners like a hole in the head: they have enough of their own problems. Several coal projects died off, whole coal-producing regions died off. I talked to workers at one coal company, where everything had degraded, there was no work, people had moved away. They’d been promised over and over again at the start, and they believed them. And now there’s just a dead region there, villages have died out. Whereas, air traffic controllers, sailors and dockers are still in demand, they are still important for people. They went on strike and got what they wanted. They provided the same stuff that people working in the 1970s were used to: allocating holidays, minor improvements in social sphere — that is, what personnel managers in the west do. Accordingly, many unions had bans on strikes written into their charters and agreements. That’s one side. On the other, the FPK-FNPR [Federation of Independent Trade Unions of Russia] monster, which unites both workers and employers continues to operate. This is completely wrong in legal terms. According to the new Labour Code, managers and management personnel are representatives of the administration. Thus, the very existence of this union is illegal. There’s the concept of the “corporate trade union”, in Italian law there’s the concept of a “convenient union” — FNPR fits this definition completely. I’ve had official meetings with Andrey Isayev. A remarkable man who went from being an anarchist to being one of the leaders of United Russia, and has managed to work everywhere, including in union work. Now he heads the Duma Committee on Work and Social Policy, and is one of the people behind the new Labour Code. Isayev claimed that FPNR is a normal trade union because high-ranking managers, directors, are also wage-earners. And that’s why they have the same interests as their employees. As a result, FNPR doesn’t even had a strike fund. The largest union in the country, which has its own sanatoria, bank and other assets, doesn’t have a strike fund, because it doesn’t carry out strikes. It doesn’t need to. AB: And what’s the name of the bank? SM: The Solidarity Bank. There was an attempt to close it down over some machinations. But it’s still in existence. And FNPR’s leader [Mikhail] Shmakov owns a country house next to [Yuri] Luzhkov’s, on the Rublyovka highway. What is the situation with trade unions in general at the moment? Trade union activity is very restricted in Russia’s new labour legislation. First, solidarity strikes are officially banned. Completely. If you want to support colleagues in the same profession, you don’t have the right to do this. Second, a clever scheme has been created [in conflict situations]: say there’s two unions at a factory — an independent union and an FNPR one — and they act in the name of a certain number of employees (for example, to finish a collective agreement), and the unions disagree, then the position of the union with more members is accepted. Given that most employees join the official union automatically (often this is a condition of employment), then the FNPR has a much better position. Many enterprises have situations where the factory director also acts as the head of the trade union. The same person. This is where you get a situation when independents unions lose the right to vote in conflicts. This is how the labour laws were drawn up. As a result, every labour dispute leads to very unpleasant consequences, and encourages far from honest behaviour by company management. AB: Do you know of any examples of successful trade union organisation in education, academia, the school system? SM: There’s a wave [of activity] right now: education employees are trying to organise themselves, particularly in secondary schools, and higher education institutes join them on occasion. The working conditions are dreadful. Despite all the national programmes, in some regions the situation is even deteriorating. They answered: “Why is that we have to organise a union? Every individual is uniquely valuable. You want us to walk around with a red flag? !” Everyone lost their jobs in the end. AB: That’s more of an example of a failure. SM: Yes, but it shows the characteristic attitude of people employed in the humanities in this kind of situation. Often, they are defeated by liberal ideology. AB: What about student trade unions? SM: Oh, that’s a separate topic! In education, there was RAPOS, the Russian Association of Student Trade Unions, which was a branch of FNPR, into which students, together with lecturers, pay their membership fees all happily together. During the mid-1990s, the left movement had the idea that we need to shift from political slogans, which often came down to “are you for the Reds or the Whites?”, do you like the Communists or not, over to social slogans. After all, for students, the most popular slogans were about raising stipends, postponement of army service, choosing professors and so on. And they have to demand that, at least on the minimal level. But even when the demands were minimal, it was considered that was already a form of radicalism. In 1968, Paris students had the slogan: “Be realistic, demand the impossible!” After that, we began to demand very minimal things, and we were called “ultra-radicals”, assistants to the “red brigades” and “maoists”. We were called everything under the sun! On the other hand, the creation of trade unions on this basis, that is with a clear ideology, helped to prevent not just a split, but the whole destruction of the youth movement, where there was a 100 conflicting groups. Even though when a trade union with a broad ideology appeared, Student Defence, it provoked distinct aversion from many idealist leftists. But in my view, this was one of the most successful projects for the left-wing movement as a whole, and not just the trade unions. We managed to increase the number of participants rapidly. AB: How did you do that? SM: It was fun, it was “cool”, there was no control by adults. All the real demands, the ones that concerned us directly, came from below, and immediately found support at the top. AB: This wasn’t only in Moscow? SM: No, in many cities: Petersburg, Tula, Novosibirsk, Rostov. There were between 10,000-15,000 people in the union in total. A significant proportion of people, if not the majority, were completely passive: they just wrote applications. But still, the biggest protests that leftists managed to hold [in the 1990s], these protests were organised by Student Defence. AB: How did this happen? SM: In April 1994, RAPOS held a public demonstration in support of raising wages. The Student Defence union turns up, takes all the crowd behind RAPOS and starts an unsanctioned mass rally behind the White House [primary office of the Russian government]. Then there’s a mass march through the centre of Moscow, as far as Theatre Square. Of course, many people got detained. I know the details from other people, I wasn’t there. Thus, with the slogan “Guys, we’re going to repeat what was fun last year”, we once again came with a large rally to the centre of Moscow. But this time, everything turned out to be far more violent — there was more police, and the riot police were also present. But the demonstration itself was far bigger. On the way there, police units tried to stop people, all the while “cutting off the tail” — they would pick people out walking at the back of the march and arrest them. The Arbat was closed off, but we managed to get past the police cordons several times by changing our tactics and taking back streets. At the Arbat, we trashed the office of the Olbi corporation (one of the rightwing corporations), then we approached the Ministry of Defence building, which we doused in paint in protest against the war in the North Caucasus, and then moved on to the Manezh. There, the OMON divided the protest into three sections, two of which were dispersed and partially detained. But the head of the column, around 150 people, tried to make it to Red Square, then went past Alexandrovsky Garden and came out at Theatre Square. There were some fascists waiting for us there, and they started a fight. In February 1995, we organised a pacifist march together with some neformaly [a term for perestroika-era informal subcultural groups] starting from the Arbat. And though it was an unsanctioned march, it wasn’t dispersed. In October 1994, at the square outside Moscow State University, we also organised an unsanctioned demonstration and burned an effigy of a bourgeois. The police tried to set local students against us (as if we were “commies”). AB: Did you manage to negotiate? SM: No, we didn’t manage to negotiate. We managed to prevent a clash, but some people were detained, roughly 10 people. We conducted our own conferences, which turned, again, into just people hanging out. We made contact with organisations in Ukraine, Moldova and Belarus, in particular, where the anti-Lukashenko youth movement was just gaining ground. Our demands were met on a range of issues. Mostly social, the simple stuff. For example, free movement inside student dormitories, payment of stipends on schedule, getting a room inside institutes — everyone had their own demands. The political work was on a very basic level. Moreover, there was a rumour going around about the union that it was just a bunch of people who make trouble. That’s why we began developing our own draft legislation on behalf of young people who were studying, and we tried to get it through the State Duma. I should have it at home somewhere. Nowadays people have started to forget about this. AB: Did you manage to force a vote on it in the Duma? SM: As far as I recall, the Communists were afraid of presenting it for an official vote, and there were no other leftists at all at that time. After 1995, Student Defence began to be less active, and there’s many reasons for that. First, who are we? Either we’re fighting for social rights, or we’re putting forward political slogans. Second, we got a huge amount of members for those times, around ten thousand. Literally, a person would arrive from Novosibirsk, carrying a packet of applications , as whole student groups would be joining Student Defence. One of the reasons is that if you’re a member of an official trade union, you have to pay fees, and you didn’t have in order to join Student Defence. We didn’t know what to do, how to accumulate these masses of people. Third, KPRF had started its pre-election race. A member of the Student Defence executive committee Dasha Mitina, had become a member of the State Duma from KPRF and took all the Komsomol people from Student Defence with her. Then, there was the problem of financing our activity. Finally, we were positioning ourselves as a radical left political trade union. And that was constraining for people: we shouldn’t have brought up ideology, we should have negotiated with people. Although there weren’t really any arguments, there was for example one conference where a group of anarchists began throwing bottles at the people who were speaking. That said, the next day, everyone sat down together and had a friendly drink. Unfortunately, phenomena like Student Defence did not grow into a system. AB: Did you try to develop mechanisms of passing on activity to younger students? SM: We couldn’t. The mechanisms of activity were rooted in the left-wing milieu, and practically no new student leaders appeared. All the leaders, the whole executive committee, were leaders of different political groups, who agreed between themselves that they wouldn’t discuss ideology. As the song goes, on your left breast you’ve got a profile of Stalin, and your right, Nestor Makhno. They asked me, by the way: “Please don’t go, stay, don’t leave! Otherwise the rest of us is just radical idiots. And with you among us, we’ll have social democrats too. We can say we have moderates too.” Of course, I could have branded myself as anything back then — and no one would have cared. Meanwhile, the majority of students reacted roughly the same: “Oh, it’s fun to be around you, it’s cool, lead us, and we’ll support you!” I would ask them: “Guys, but can you organise anything yourselves?” “Well no, we don’t have the skills.” In this sense, to create a system, to ensure there was rotation [of people], was incredibly difficult. Then there was the severe deficit of personnel — some of the anarchists left, some of the leftists, the Komsomol guys went into different work. I know that there’s attempts to restore that experience now, people are trying to reproduce our actions literally on a volunteer basis, but they are repeating the same mistakes, because there is no experience, no transfer of experience. Starting from 1996, I moved into “Protectors of the Rainbow” and other ecological movements. Several people from Student Defence moved into different things. AB: But why? Did you think that would be something more mobile? SM: Whether it was mobile or not, it was real work. Student Defence remained, on the one hand, an indicator of possibilities — an indicator of what was possible — and, on the other, was an indicator of short-term development at a sprint. Towards the end, from 1995 onwards, the fracturing could already be felt. Although people were still afraid of us, and Mikhail Shmakov, head of the FNPR, invited Dmitry Petrov, representative of Moscow Student Defence Committee, and tried to convince him that we shouldn’t be doing what we were doing. AB: Were there any links with other trade union organisations? Joint actions? SM: There were some links. For example, with the Defence union, run by [Yuri] Leonov. [Oleg] Shein wasn’t there back then, now he’s active. I realised that this independent union was afraid of student activism. We tried organise something with the workers: demonstrations under the slogan “Students and workers together”. It didn’t work out. But as a rule workers find ideologisation to be a problem, and here idealist workers need super-ideologisation, in their view. At Student Defence, we had politicisation without ideologisation. The people involved in this action or that action changed over a lot. It was just a whole kaleidoscope of people. There was no clear structure, and that was our shortcoming, we couldn’t say precisely how many people we had in a given institute. Twenty people might turn up from one institute one day, and then afterwards we wouldn’t be able to find anyone. It was a floating contingent of people. We would see several old members constantly, then some new people and certain groups. This is one of the characteristics of the student community, it “floats”. You can raise a mass of people for individual demonstrations, and it will have a lot of energy. But it’s impossible to do this constantly: they have no permanent professional interests, as these interests disappears when they leave university for work. The only people left are graduate students, perhaps. And the university administration can pressure them. AB: In your opinion, there are no permanently operating trade unions that could influence the situation on the national level, and not just individual enterprises? Is it the same for the intellectual and student sectors? SM: I don’t think there’s a need to create a trade union for students — unions are for representatives of professional groups. But the defence of students in specific industry universities should be part of a trade union movement’s tasks. The movement is needed so that students feel themselves part of a union environment. This kind of trade union movement is needed also because students are more interested in getting jobs, and connection with industry could turn out to be useful. And as someone who works in the legal sphere, this could help make contacts. AB: But now there’s the same problem in all education institutes – starting from the small ones and ending with Moscow State University – when there’s more graduates than jobs in the universities and in industry. There are virtual queues for jobs at universities. And the university administration always has a means of pressuring you: if you don’t get on your knees, don’t respond to my extreme demands, then the next person in the queue will take your job on worse conditions. SM: Completely correct. This is where a trade union comes in, which tells a student: these enterprises are under our control, and they have their own waiting list for selecting graduates from your institutes. It turns out that we need to start from scratch and once again teach trade unions the methods of collective work and cooperation. We need to ensure that any given enterprise is under the control of a trade union of workers, which participates in the management, owns both a deciding proportion of shares and can influence the enterprise’s work, including personnel decisions. And every member of the union should realise that the union will not let him be fired just like that. But this doesn’t exist at the moment, and the legislation is written to prevent it. And not everything is decided by federal-level labour legislation, but is handed down to the lower levels. After all, apart from banning secondary strikes, there’s a new norm that permits everything to be negotiated at the level of individual and collective labour contracts. In general, at many factories, there’s no one who can draw up a correct collective contract. If the lawyer works for the employer, then of course it’s clear who the contract is going to favour. It’s clear in whose interest this worker-level control is going to be carried out — the employer’s. AB: Were there any cases when people who had gained experience of organised resistance at one enterprise then transferred it to another? Was this experience somehow accumulated and spread? SM: This is another issue, as it happens only weakly. Maybe at some individual level, but there is no system. Today, there is an extreme fracturing of the labour movement.